Dr. Shahar Rabi: Registered Clinical Counsellor and Co-Founder and Director of Education for the New Earth Institute, Dr. Shahar Rabi is currently the Program Director at the Orchard Recovery Centre on Bowen Island. He also teaches at City University of Seattle and Adler school, both located in Vancouver. His academic research has been mainly focused on mindfulness and body-centred interventions as means for well-being, connection and growth. He has a great deal of experience in teaching and bringing together Eastern and Western wisdom in a practical and accessible manner. 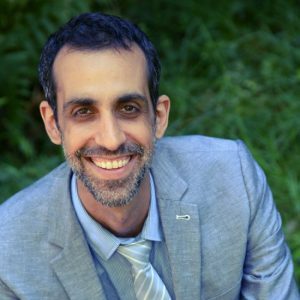 Shahar has worked for several years as a mindfulness and body-centred therapist and educator in Canada, Israel, and India. For his work with disadvantaged soldiers, he earned a medal of honour from the President of Israel. Shahar also has a broad spectrum of work experience as a choreographer, philosophy teacher, yoga teacher, meditation instructor, and even a clown! He brings his knowledge from all of these fields to his work with students and clients. As a meditation instructor, he draws on years of study and practice with prominent non-dual teachers from various traditions at monasteries in India, Nepal, and Thailand. Bai, H., Cohen, A. & Rabi, S. (2014), Post-individualist pedagogy: Relationship as teaching. In Deer, F., Falkenberg, T., McMillan, B., & Sims. L. (Eds.). Education for sustainable well-being: Concepts, issues, perspectives, and practices. Winnipeg, MB: Education for Sustainable Well-being Research Group. pp. 23-36. Park, S., Rabi, S., (2014). Improvising Vulnerability Through Freestyle Rap Inquiry. Ed.. Walsh, S., Bickel, B., Leggo, C., Arts-based and Contemplative Practices in Research and Teaching Honouring Presence. Routledge Research in Education. pp. 125- 239. Bai, H., A. Cohen, T. Culham, S. Park, S. Rabi, C. Scott, and S. Tait, (2013). “A Call for Wisdom in Higher Education: Voices of Contemplative Inquiry.” In O. Gunnlaugson, E. Sarath, H. Bai, and C. Scott (Eds.) Contemplative Approaches to Learning and Inquiry. New York: SUNY Press. pp. 287-302. S. Rabi and S. Tait, “Integral Theory Applications in International Development Education.” In G. Hochachka (Ed. ), Applied Integral Theory. New York: State University of New York Press (2015— Forthcoming). S. Rabi, “The Future of Addiction Curriculum in Treatment Centres” (2014). Orchard Recovery Centre, Bowen Island, BC. S. Rabi, “Assessment analysis of clients satisfaction 2013 -2014”. Orchard Recovery Centre, Bowen Island, BC. S. Rabi, “Assessment analysis of clients satisfaction 2014 – 2015”. Orchard Recovery Centre, Bowen Island, BC. S. Rabi, “Continuing care in treatment centres— a full revision” (2015). Orchard Recovery Centre, Bowen Island, BC.